British aviators John Alcock and Arthur Brown made the first non-stop transatlantic flight in June 1919. They flew a modified First World War Vickers Vimy bomber from St. John's, Newfoundland, to Clifden, Connemara, County Galway, Ireland. The Secretary of State for Air, Winston Churchill, presented them with the Daily Mail prize for the first crossing of the Atlantic Ocean by aeroplane in "less than 72 consecutive hours". A small amount of mail was carried on the flight, making it the first transatlantic airmail flight. The two aviators were awarded the honour of Knight Commander of the Most Excellent Order of the British Empire (KBE) a week later by King George V at Windsor Castle. John Alcock was born in 1892 in Basford House on Seymour Grove, Firswood, Manchester, England. Known to his family and friends as "Jack", he first became interested in flying at the age of seventeen and gained his pilot's licence in November 1912. Alcock was a regular competitor in aircraft competitions at Hendon in 1913–14. He became a military pilot during the First World War and was taken prisoner in Turkey after the engines on his Handley Page bomber failed over the Gulf of Xeros. After the war, Alcock wanted to continue his flying career and took up the challenge of attempting to be the first to fly directly across the Atlantic. Arthur Whitten Brown was born in Glasgow, Scotland in 1886 to American parents, and shortly afterwards the family moved to Manchester. Known to his family and friends as "Teddie", he began his career in engineering before the outbreak of the First World War. Brown also became a prisoner of war, after being shot down over Germany. Once released and back in Britain, Brown continued to develop his aerial navigation skills. During his imprisonment Alcock had resolved to fly the Atlantic one day, and after the war he approached the Vickers engineering and aviation firm at Weybridge, who had considered entering their Vickers Vimy IV twin-engined bomber in the competition but had not yet found a pilot. Alcock's enthusiasm impressed the Vickers' team and he was appointed as their pilot. Work began on converting the Vimy for the long flight, replacing the bomb racks with extra petrol tanks. Shortly afterwards Brown, who was unemployed, approached Vickers seeking a post and his knowledge of long distance navigation persuaded them to take him on as Alcock's navigator. Several teams had entered the competition and when Alcock and Brown arrived in St. John's, Newfoundland, the Handley Page team were in the final stages of testing their aircraft for the flight, but their leader, Admiral Mark Kerr, was determined not to take off until the plane was in perfect condition. The Vickers team quickly assembled their plane and at around 1:45 p.m. on 14 June, whilst the Handley Page team were conducting yet another test, the Vickers plane took off from Lester's Field. Alcock and Brown flew the modified Vickers Vimy, powered by two Rolls-Royce Eagle 360 hp engines which were supported by an on-site Rolls Royce team led by engineer Eric Platford. It was not an easy flight. The overloaded aircraft had difficulty taking off the rough field and only barely missed the tops of the trees. At 17:20 the wind-driven electrical generator failed, depriving them of radio contact, their intercom and heating. An exhaust pipe burst shortly afterwards, causing a frightening noise which made conversation impossible without the failed intercom. At 5.00pm they had to fly through thick fog. This was serious because it prevented Brown from being able to navigate using his sextant. Blind flying in fog or cloud should only be undertaken with gyroscopic instruments, which they did not have, and Alcock twice lost control of the aircraft and nearly hit the sea after a spiral dive. Alcock also had to deal with a broken trim control that made the plane become very nose-heavy as fuel was consumed. At 12:15am Brown got a glimpse of the stars and could use his sextant, and found that they were on course. Their electric heating suits had failed, making them very cold in the open cockpit. Then at 3:00am they flew into a large snowstorm. They were drenched by rain, their instruments iced up, and the plane was in danger of icing and becoming unflyable. The carburettors also iced up; it has been said that Brown had to climb out onto the wings to clear the engines, although he made no mention of that. They made landfall in County Galway, crash-landing at 8:40 a.m. on 15 June 1919, not far from their intended landing place, after less than sixteen hours' flying time. The aircraft was damaged upon arrival because of an attempt to land on what appeared from the air to be a suitable green field, but which turned out to be Derrygilmlagh Bog, near Clifden in County Galway in Ireland, but neither of the airmen was hurt. Brown said that if the weather had been good they could have pressed on to London. Their altitude varied between sea level and 12,000 ft (3,700 m). They took off with 865 imperial gallons (3,900 L) of fuel. They had spent around fourteen-and-a-half hours over the North Atlantic crossing the coast at 4:28 p.m., having flown 1,890 miles (3,040 km) in 15 hours 57 minutes at an average speed of 115 mph (185 km/h; 100 knots). Their first interview was given to Tom 'Cork' Kenny of The Connacht Tribune. 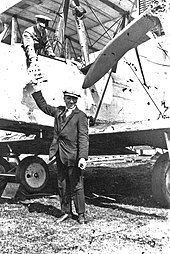 Alcock and Brown were treated as heroes on the completion of their flight. In addition to the Daily Mail award of £10,000, the crew received 2,000 guineas (£2,100) from the Ardath Tobacco Company and £1,000 from Lawrence R. Phillips for being the first British subjects to fly the Atlantic Ocean. Both men were knighted a few days later by King George V.
Alcock and Brown flew to Manchester on 17 July 1919, where they were given a civic reception by the Lord Mayor and Corporation, and awards to mark their achievement. Alcock was killed on 18 December 1919 when he crashed near Rouen whilst flying the new Vickers Viking amphibian to the Paris Airshow. Brown died on 4 October 1948. Two memorials commemorating the flight are sited near the landing spot in County Galway, Ireland. The first is an isolated cairn four kilometres south of Clifden on the site of Marconi's first transatlantic wireless station from which the aviators transmitted their success to London, and around 500 metres from the spot where they landed. In addition there is a sculpture of an aircraft's tail-fin on Errislannan Hill two kilometres north of their landing spot, dedicated on the fortieth anniversary of their landing, 15 June 1959. Three monuments mark the flight's starting point in Newfoundland. One was erected by the Government of Canada in 1952 at the junction of Lemarchant Road and Patrick Street in St. John's, a second monument is located on Lemarchant Road, while the third was unveiled by Premier of Newfoundland and Labrador Joseph Smallwood on Blackmarsh Road. A memorial statue was erected at London Heathrow Airport in 1954 to celebrate their flight. There is also a monument at Manchester Airport, less than 8 miles from John Alcock's birthplace. Their aircraft (rebuilt by the Vickers Company) is located in the Science Museum in South Kensington, London. The Royal Mail issued a 5d (approximately 2.1p in modern UK currency) stamp commemorating the 50th anniversary of the flight on 2 April 1969. Two weeks before Alcock and Brown's flight, the first transatlantic flight had been made by the NC-4, a United States Navy flying boat, commanded by Lt. Commander Albert Cushing Read, who flew from Naval Air Station Rockaway, New York to Plymouth with a crew of five, over 23 days, with six stops along the way. This flight was not eligible for the Daily Mail prize since it took more than 72 consecutive hours and also because more than one aircraft was used in the attempt. A month after Alcock and Brown's achievement, British airship R34 made the first double crossing of the Atlantic, carrying 31 people (one a stowaway) and a cat; 29 of this crew, plus two flight engineers and a different American observer, then flew back to Europe. On 2–3 July 2005, American adventurer Steve Fossett and co-pilot Mark Rebholz recreated the flight in a replica of the Vickers Vimy aeroplane. They did not land in the bog near Clifden, but a few miles away on the Connemara golf course. A replica Vimy, NX71MY, was built in Australia and the USA in 1994 for an American, Peter McMillan, who flew it from England to Australia with Australian Lang Kidby in 1994 to re-enact the first England-Australia flight by Ross & Keith Smith with Vimy G-EAOU in 1919. In 1999, Mark Rebholz and John LaNoue re-enacted the first flight from London to Cape Town with this same replica, and in late 2006 the aeroplane was donated to Brooklands Museum at Weybridge, Surrey. After making a special Alcock and Brown 90th anniversary return visit to Clifden in June 2009 (flown by John Dodd and Clive Edwards), and some final public flying displays at the Goodwood Revival that September, the Vimy made its final flight on 15 November 2009 from Dunsfold Park to Brooklands crewed by John Dodd (pilot), Clive Edwards and Peter McMillan. Retired from flying for the foreseeable future, it is now on public display in the Museum's Bellman hangar but will be maintained to full airworthy standards. One of the propellers from the Vickers Vimy was given to Arthur Whitten Brown and hung for many years on the wall of his office in Swansea before he presented it to the RAF College Cranwell. It is believed to have been displayed in the RAF Careers Office in Holborn until 1990. It is believed to be in use today as a ceiling fan in Luigi Malone's Restaurant in Cork, Ireland. The other propeller, serial number G1184.N6, was originally given to the Vickers Works Manager at Brooklands, Percy Maxwell Muller and displayed for many years suspended inside the transatlantic terminal (Terminal 3) at London's Heathrow Airport. In October 1990 it was donated by the BAA (via its former Chairman, Sir Peter Masefield) to Brooklands Museum, where it is now motorised and displayed as part of a full-size Vimy wall mural. A small amount of mail, 196 letters and a parcel, was carried on Alcock and Brown's flight, the first time mail was carried by air across the ocean. The government of the Dominion of Newfoundland overprinted stamps for this carriage with the inscription "Transatlantic air post 1919". Upon landing in Paris after his own record breaking flight in 1927, Charles Lindbergh told the crowd welcoming him that "Alcock and Brown showed me the way!" The Phantom FGR.2 (XV424) that made the crossing departing the International Air Tattoo in 1979. To mark the original transatlantic crossing, on the 1 June 1979 two Royal Air Force McDonnell Douglas Phantom FGR.2s – XV424 (of No. 56 Squadron) and (RAF Coningsby based) XV486, were sprayed in special commemorative schemes. The scheme was designed by aviation artist Wilfred Hardy. As well as marking the anniversary of the crossing, the scheme also made reference to usage of Rolls-Royce engines in both aircraft: the Rolls-Royce Eagle in the Vimy and the Rolls-Royce Spey in the Phantom FGR.2, and on top of this it also marked the 30th anniversary of North Atlantic Treaty Organization (NATO). On 21 June, XV424 took off from Goose Bay, Newfoundland and began the crossing to Ireland. Flying subsonically the entire time, the journey took 5 hours and 40 minutes, setting a new record. The Phantom was refuelled five times throughout the crossing, with that being taken care of by Handley-Page Victor K.2 tankers of No. 57 Squadron. XV424 today is preserved at the RAF Museum in Hendon, sporting colours of No. 56 (Fighter) Squadron, while XV486 was scrapped in 1993. 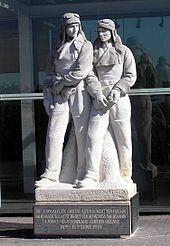 ^ "Captain John Alcock and Lieutenant Arthur Whitten Brown". www.aviation-history.com. ^ "Alcock and Brown's Vickers Vimy biplane, 1919". Science Museum. Retrieved 4 February 2017. ^ "What are the wild waves saying". The Economist. 28 October 2010. Retrieved 3 November 2010. Jack Alcock and Arthur Whitten Brown became the first men to cross the Atlantic by air in June 1919, flying in a Vickers Vimy biplane, its bomb bays filled with extra fuel. The dashing aviators, who took their pet kittens, Twinkletoes and Lucky Jim, with them, made the crossing from Newfoundland to County Galway in 16 hours and 27 minutes. ^ "Captain Jack Alcock (1892–1919)" (PDF). Museum of Science & Industry. 2006. Archived from the original (PDF) on 31 March 2014. Retrieved 13 September 2013. ^ Cooksley, Peter G. ‘Alcock, Sir John William (1892–1919)’, in Oxford Dictionary of National Biography (Oxford University Press, 2004), online ed., Jan 2011; accessed 16 June 2012. ^ Shepherd, E. C. ‘Brown, Sir Arthur Whitten (1886–1948)’, rev. Peter G. Cooksley, in Oxford Dictionary of National Biography (Oxford University Press, 2004), online ed., Jan 2011; accessed 16 June 2012. ^ a b c d e f g h i j "Capt. John Alcock and Lt. Arthur Whitten Brown". ^ a b c d e f g h i "Flight Global article". ^ "Derrigimlagh, County Galway". Tourism Ireland. Retrieved 14 June 2018. ^ "Alcock and Brown Knighted by King George V". Flight magazine. 26 June 1919. p. 830. Retrieved 9 January 2009. ^ MacEachern, Daniel (18 October 2014). "St. John's finance committee rejects request for funding to repair vandalized monument". The Telegrah. Retrieved 21 October 2015. ^ "Burton Constable 2". The Antiques Roadshow. Series 39. 19 March 2017. BBC. BBC 1. ^ Abbott, Patrick (1994). Airship: The Story of R34. Studley, Warwickshire: Brewin Books. pp. 13–14. ISBN 1-85858-020-X. ^ Abbott. Airship. p. 64. ^ "U.S. pair re-create record trans-Atlantic flight". 3 July 2005. ^ Turner, Robin (1 December 2009). "Writer seeks propeller from plane that first crossed Atlantic". walesonline. Media Wales Ltd. Retrieved 15 June 2012. ^ Fallon, Linda (2007). Cork, 2nd: The Bradt City Guide (Bradt Mini Guide). Bradt Travel Guides. p. 105. ISBN 1-84162-196-X. ^ "The Postal History of ICAO - International Exhibition of Air Mail Postage". International Civil Aviation Organization. 1969. Retrieved 16 June 2016. ^ Anon (19 June 1919). "Deliver Atlantic Air Mail: Alcock and Bown leave letters they carried in London" (PDF). The New York Times. The New York Times. p. 8. Retrieved 15 June 2012. ^ a b c d e "McDONNELL DOUGLAS PHANTOM FGR2 XV424" (PDF). RAF Museum. Retrieved 10 December 2018. ^ a b "MDD Phantom FGR.2 Alcock & Brown". Hansen Fine Art. Retrieved 10 December 2018. ^ "XV424 - RAF Museum, Hendon, Greater London". Thunder & Lightnings. Retrieved 10 December 2018. ^ "Displaying Serials in range XV". ukserials.com. Retrieved 10 December 2018. Alcock and Brown at "Flights of Inspiration"
This page is based on the Wikipedia article Transatlantic flight of Alcock and Brown; it is used under the Creative Commons Attribution-ShareAlike 3.0 Unported License (CC-BY-SA). You may redistribute it, verbatim or modified, providing that you comply with the terms of the CC-BY-SA.